When you decide to purchase an aquarium there are more options involved in this decision than most people realize but how many of them do you really need. Many people aren't interested in a four figure glass cage that will awe everyone that sees it, they just want to learn more about and care for an interesting species of pet, they just want a cheap aquarium. All the special options and inclusions are not really all that important all thats important is finding a non costly solution to where they can house the animals they are interested in. If you want to buy a new aquarium either to avoid the hazards of a used one or simply because it is less complicated there are many things you can do to cheapen your purchase. Avoid special options like a drilled tank or star fire glass. 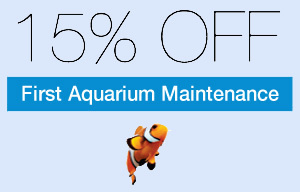 Also for any typical sized aquarium glass is quite a bit cheaper than acrylic. There is also significant difference in prices between brands, the cheaper brands do cut corners in glass thickness and stand sturdiness, but they are still plenty strong enough in both cases to perform their necessary functions. Choosing a new aquarium will include several benefits like warrentees and being completely free of scratches and even not having to clean it, but this guide is about saving money and it is much cheaper to look for a used tank for sale. There are a lot of places to find a used aquarium and it's very possible to find one that will meet the needs of the animals and owners alike. Buying a used aquarium is a good choice for saving money but you have to be more careful in order to avoid making a mistake in your purchase. You should look over the aquarium very closely, check for any cracks in the glass or acrylic. If possible fill it up to make sure it holds water. Check closely for scratches or blemishes, these usually don't compromise the integrity of the tank just the beauty, so if you don't mind this then scratches can be ignored. Inspect the edges and corners of the tank and make sure they are all flush with one another and the edges are smooth, these could weaken the aquarium and sharp edges could also cut someone. Check the silicone binding or bonded seams on the aquarium to make sure they are smooth without any bubbles or air pockets in them ,as these might leak or soon lead to a leak. Ask the current owner about the age of the tank and if you can, do some research on line about the typical lifespan of the particular brand of aquarium you are considering purchasing. If the tank your considering comes with a stand you should make sure its level and that it appears to be of high enough quality to support the weight of the tank and the water in it, a gallon of water weighs about ten pounds and this can add up quite quickly. A stand that was manufactured and built for the purpose of holding an aquarium should do fine, but be careful of homemade or makeshift stands from other furniture. Knowing where to look for a used aquarium could be a problem too but there are many places you can go. Any place in your area you would look for used goods is a good place to start, this can be a local classified ad in a paper or online classified ad like craigslist or gumtree. You can also look on Ebay but be careful to search tanks close to your location because they will most likely be local pickup only items with no shipping option.